(Newburyport MA) This game was close, very close. There were six lead changes and seven ties. 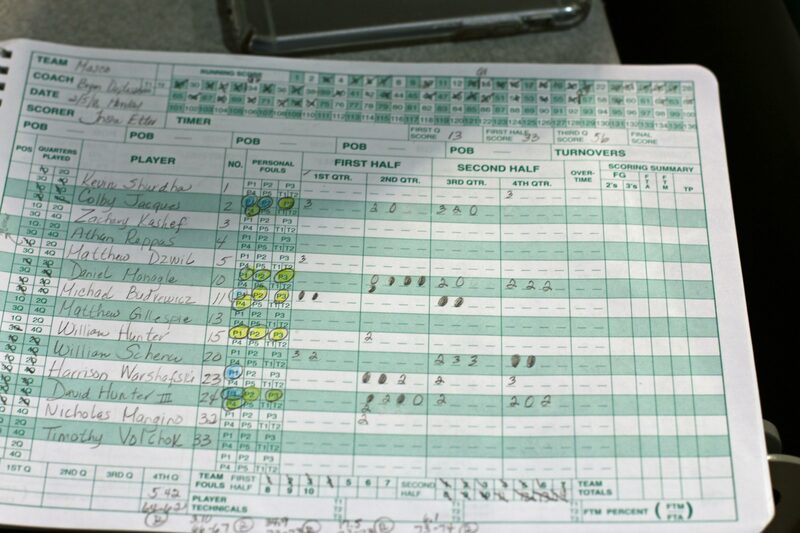 It was a one-point game (53-52) with three minutes left. 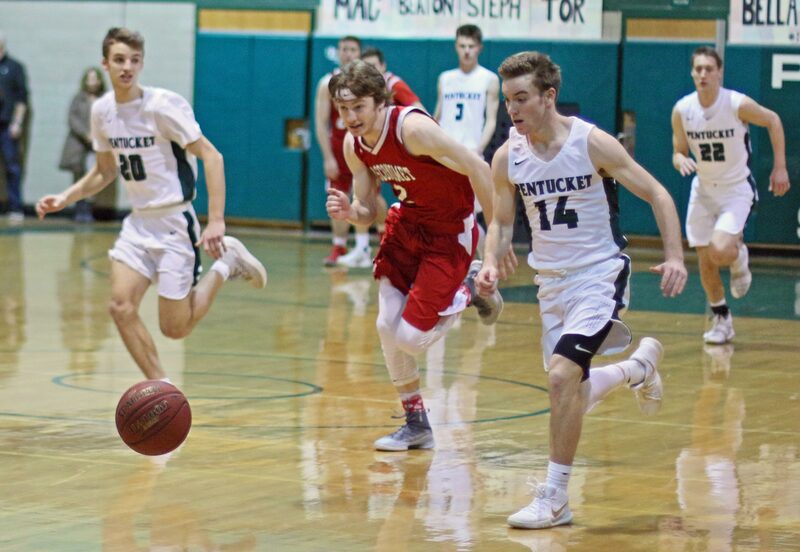 Anyone’s game, for sure, before Pentucket took it over with eight straight points and defeated Newburyport, 63-57, on Senior Night on Friday. 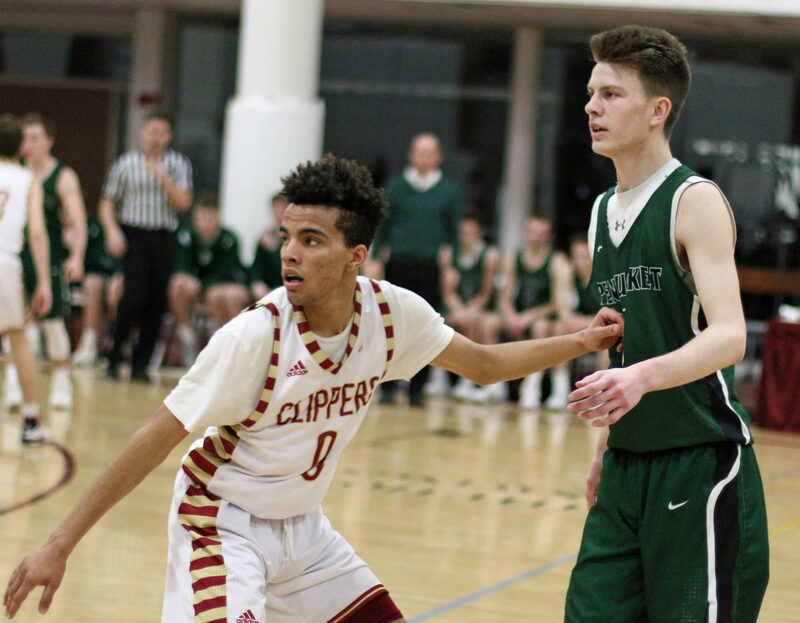 Newburyport coach Dave Clay referenced his team’s defense afterwards: “We needed to play better help defense.” Who could argue? 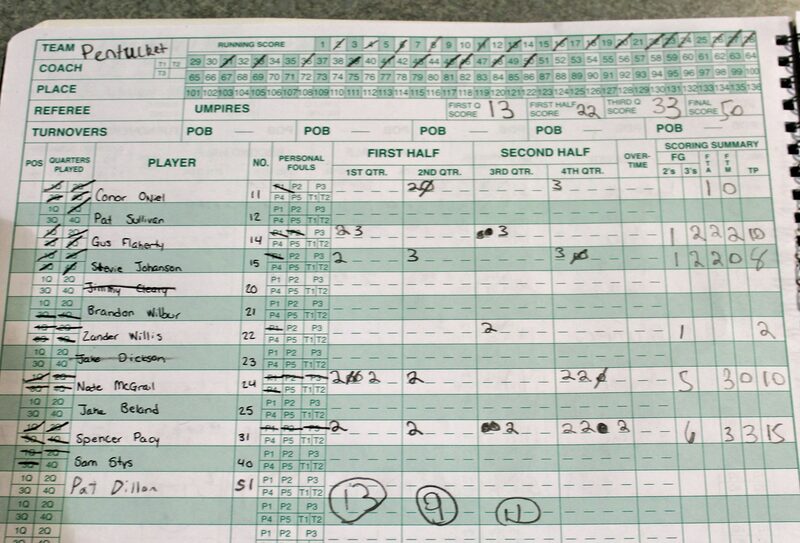 The Sachems registered seventeen layups, by my count. 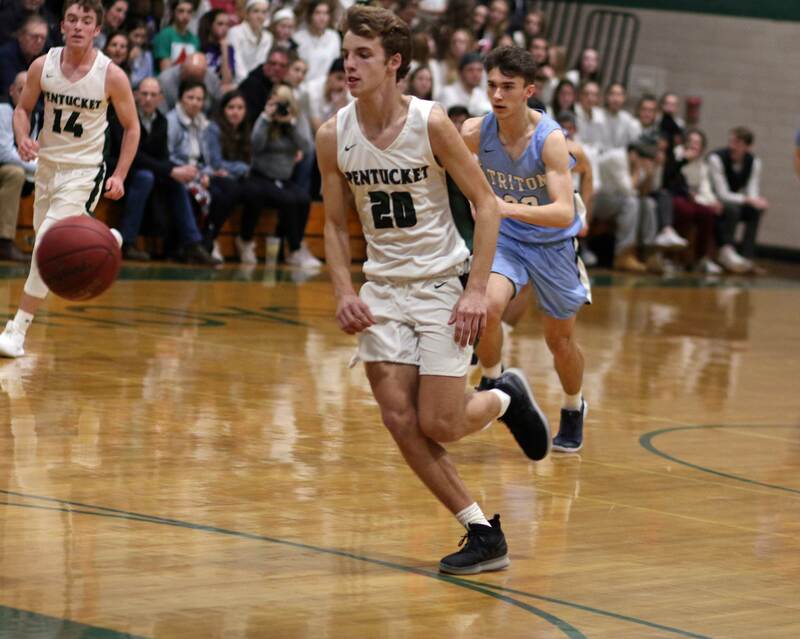 In the crucial eight-point streak in the final three minutes of the game it was four drives to the rim that turned this game to Pentucket. 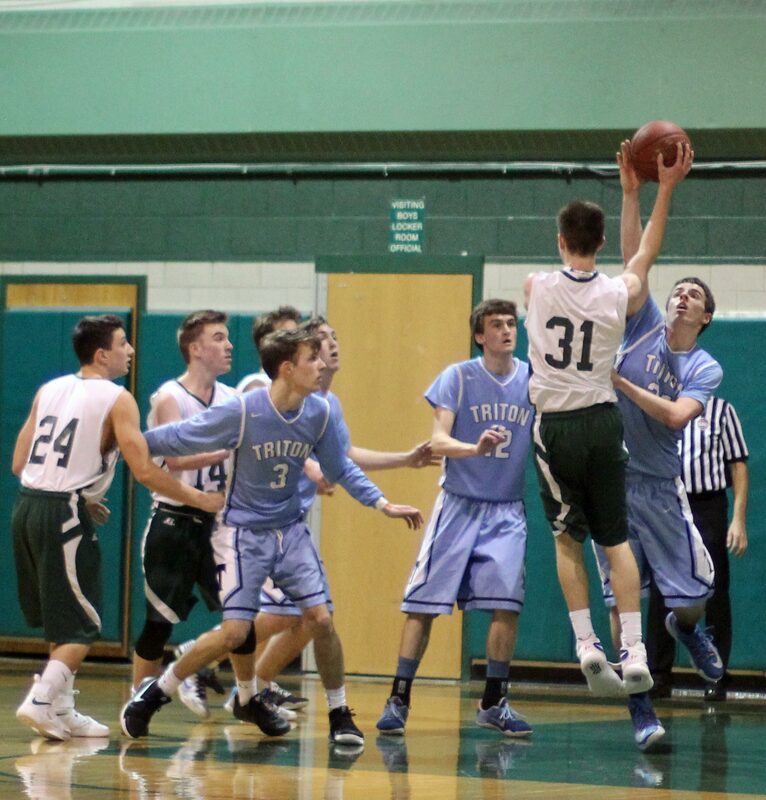 The Sachems played a high 3-2 zone that limited the outside looks of NHS. It did open things up for Parker McLaren (19 points) in the lane area. 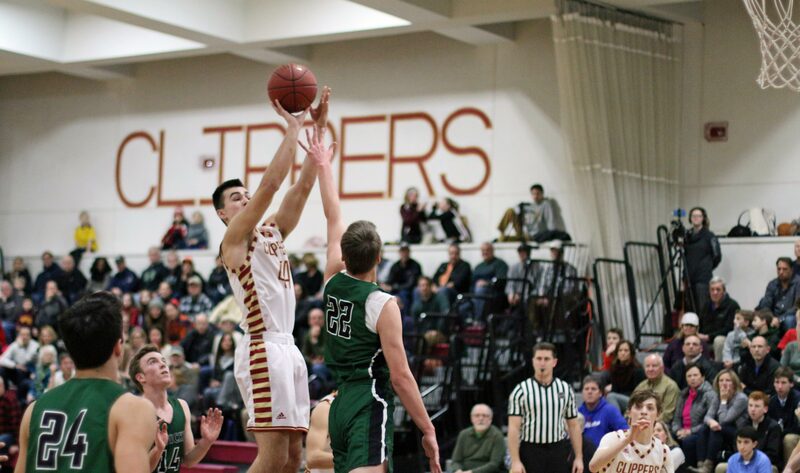 Junior Spencer Pacy (17 points) got to the rim successfully eight different times. Let’s review the game-changing segment in the final three minutes. 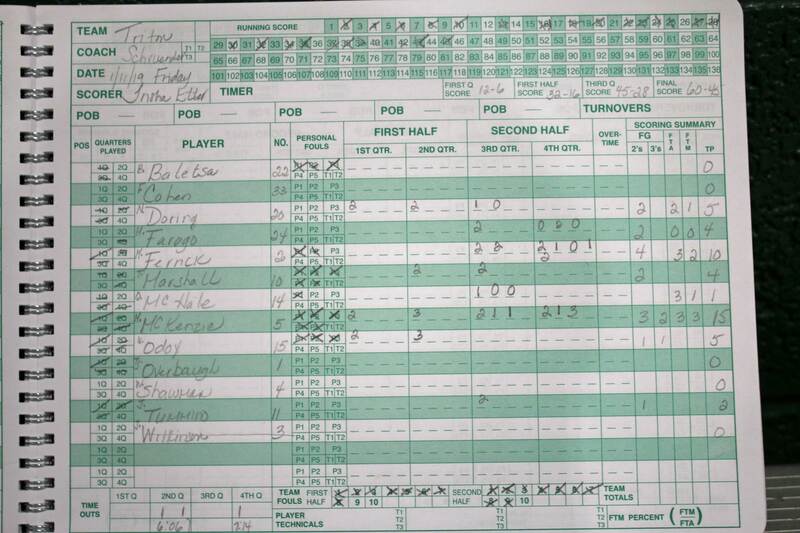 After a three by Casey McLaren (15 points), the home team trailed by only a point (53-52). 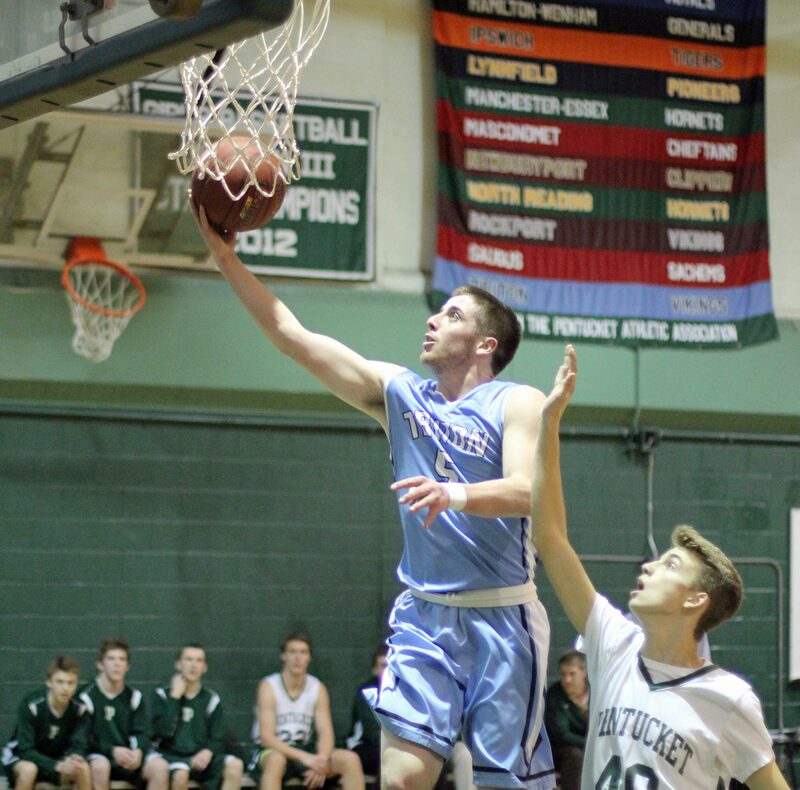 Nate McGrail (19 points) then scored a layup and was fouled but missed the freebie. Next possession by Newburyport ended with a technical foul. 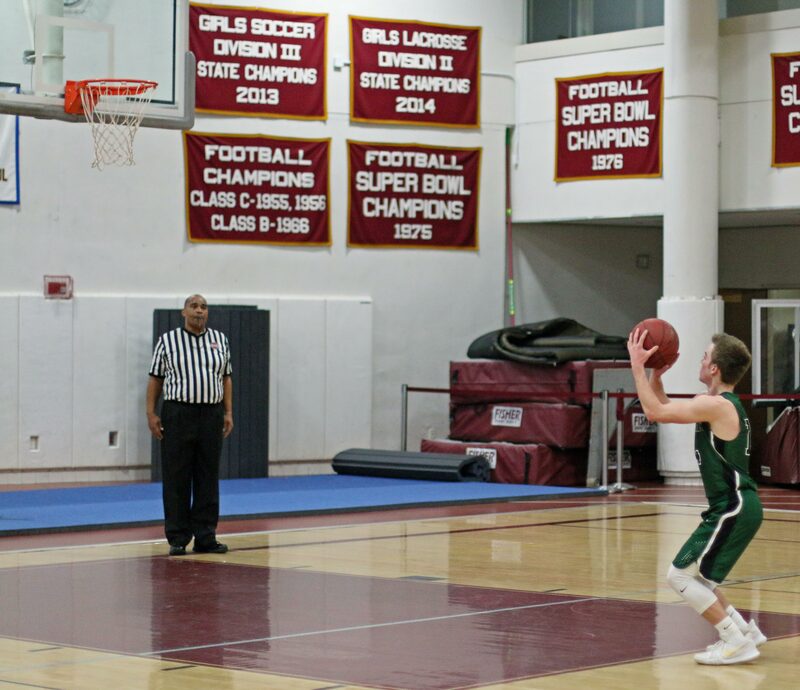 Gus Flaherty tallied both technical free throws boosting the Sachems lead to 57-52 with 2:45 to go. 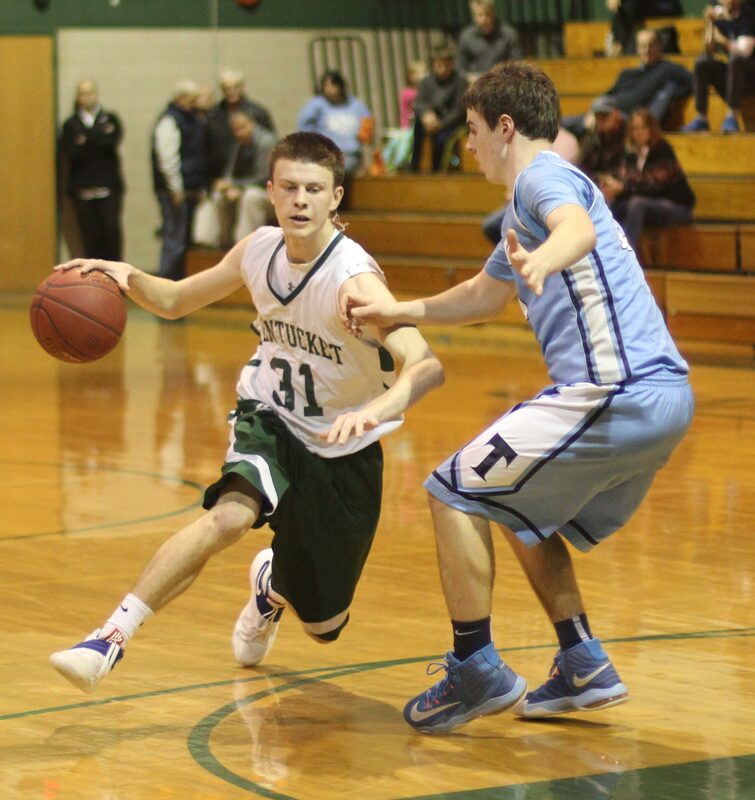 After a turnover, Pentucket had two profitable possessions in a row. Both were assisted layups. First by Sam Stys from Alex Willis and then Gus Flaherty from Spencer Pacy. 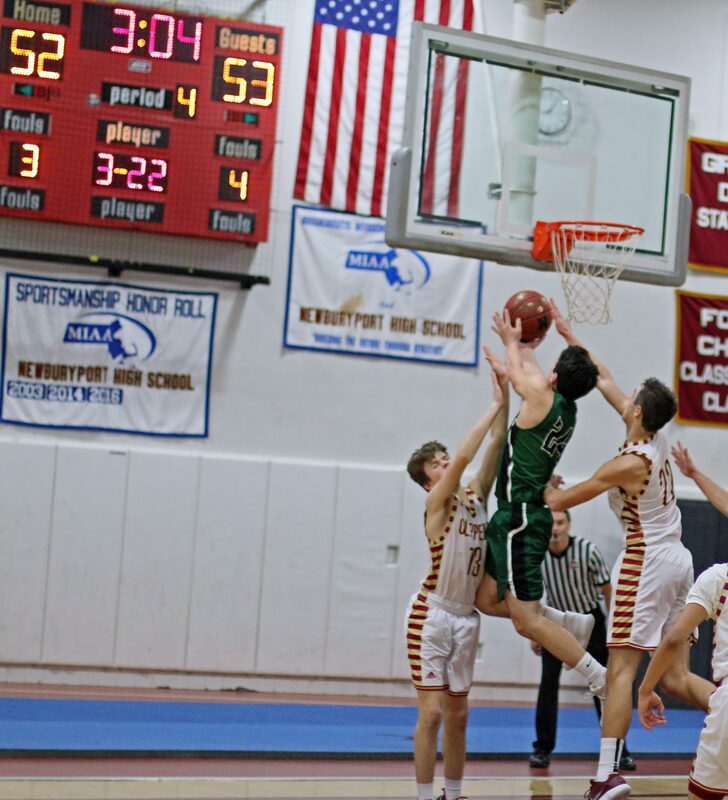 Those two plays extended the Pentucket advantage to nine (61-52) with a minute left. Game. Set. Match. “We made extra passes and it opened things up,” said Coach Hickey. 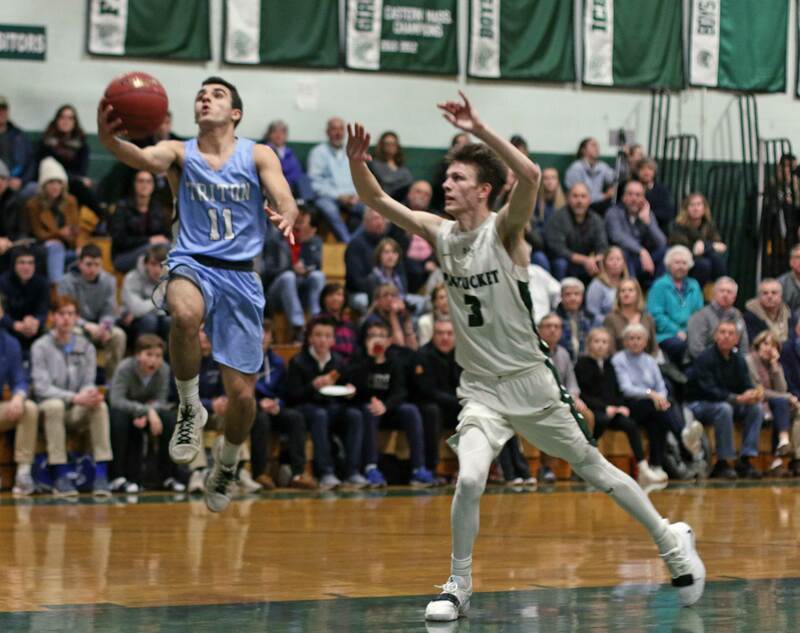 The visitors from West Newbury had another run of eight unanswered points in the final three minutes of the first half changing a 31-23 score into a halftime tie. Newburyport put a 10-2 collection together in the first period with five different players (Ryan MacDonald, Ryan Archie, George Coryell, Casey McLaren, Parker McLaren) contributing. The Clippers will close out the regular season with four straight away games. 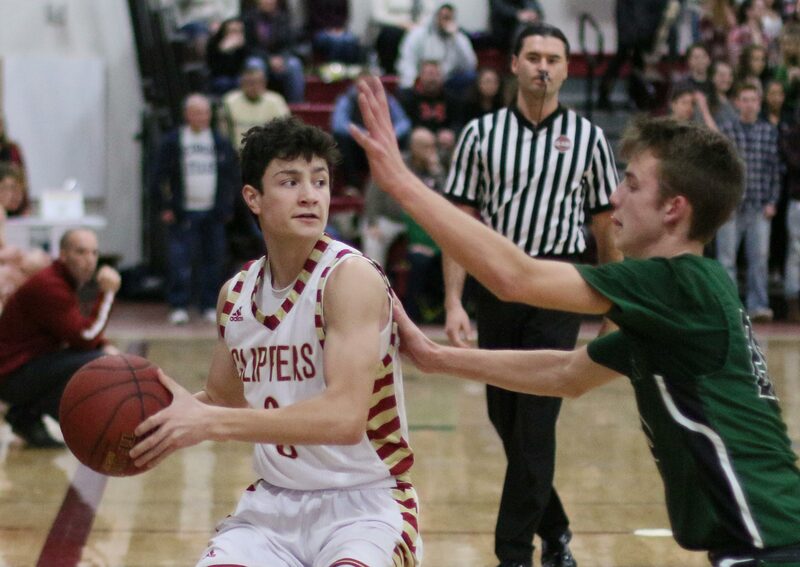 The Sachems have now defeated Newburyport three straight times. 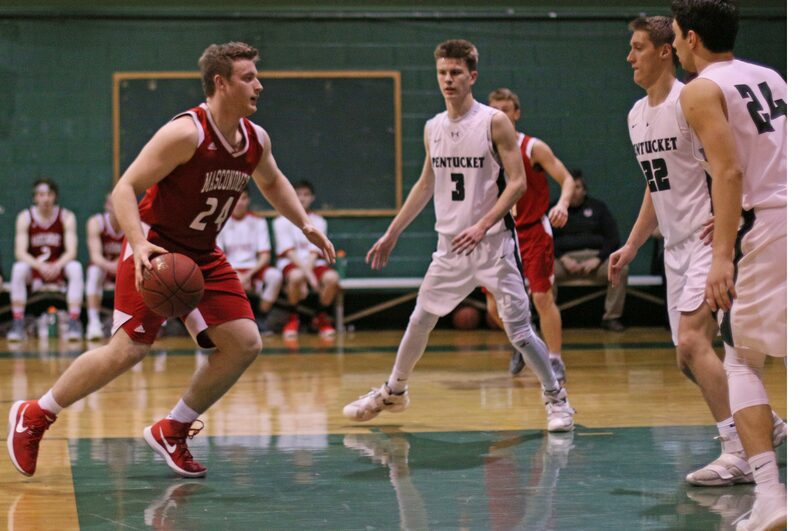 The Sachems have a 7-5 edge versus NHS over the past five seasons. 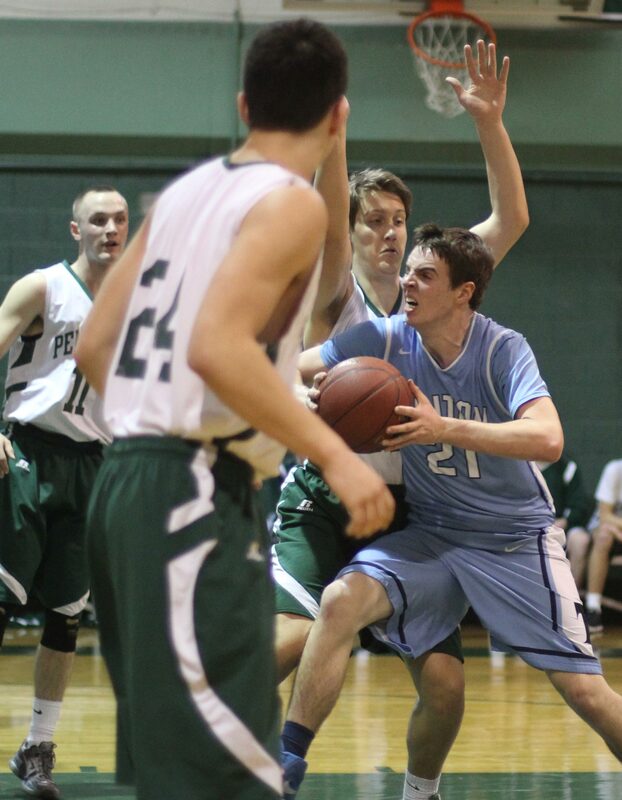 Gus Flaherty had twenty-three points in the first meeting (68-54 Pentucket win) including five 3’s. 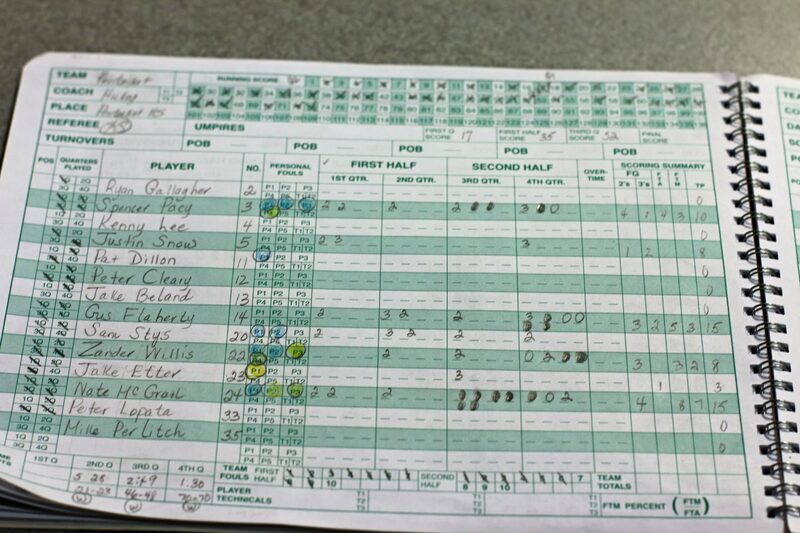 The Clippers took the long shot away (Gus had only one 3 in tonight’s game) but gave up too many inside scores. 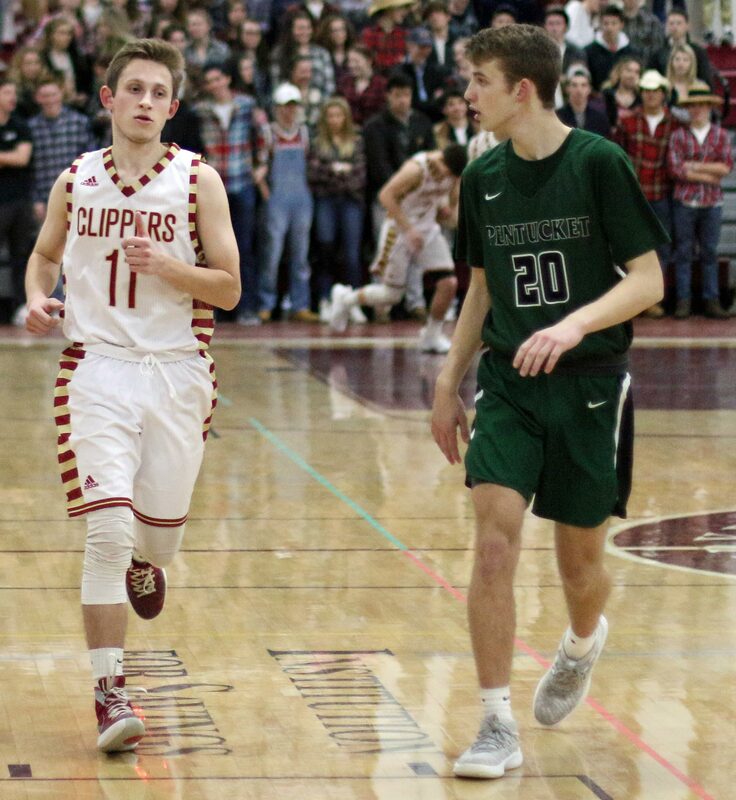 The Clippers five seniors, and their families, were honored before the game and started the game even though none of them were normally starters. 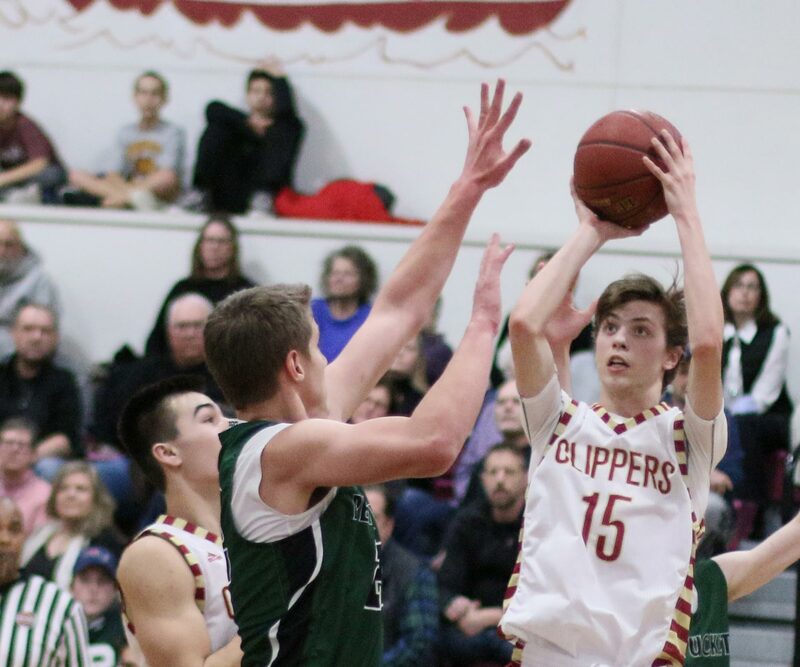 Newburyport (11-6) and Pentucket (12-5) are both in the post-season tournament and both are in Division 3. And both of them are in the north. Point? They could meet again this season. (Newburyport MA) You can’t always get away with things in a football game. 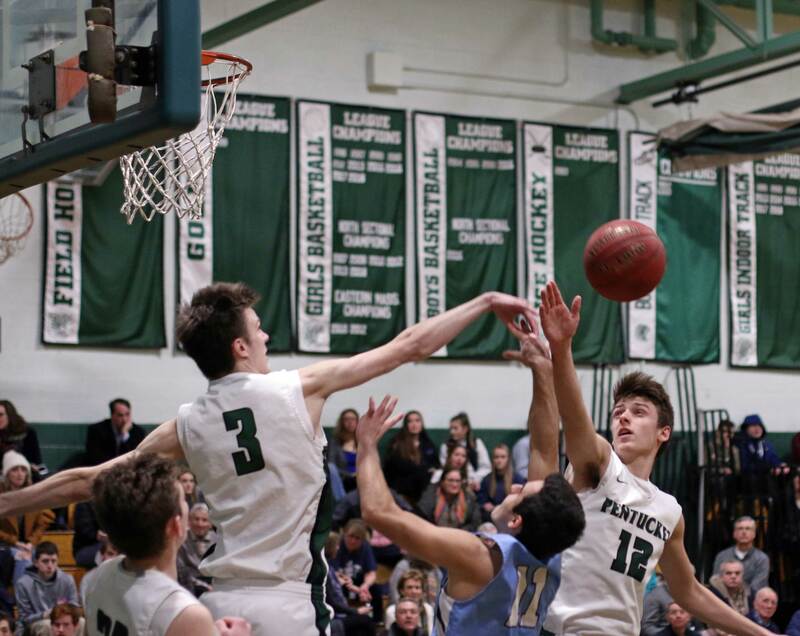 And that was certainly the case for Pentucket on Friday night as they were done in by three turnovers. 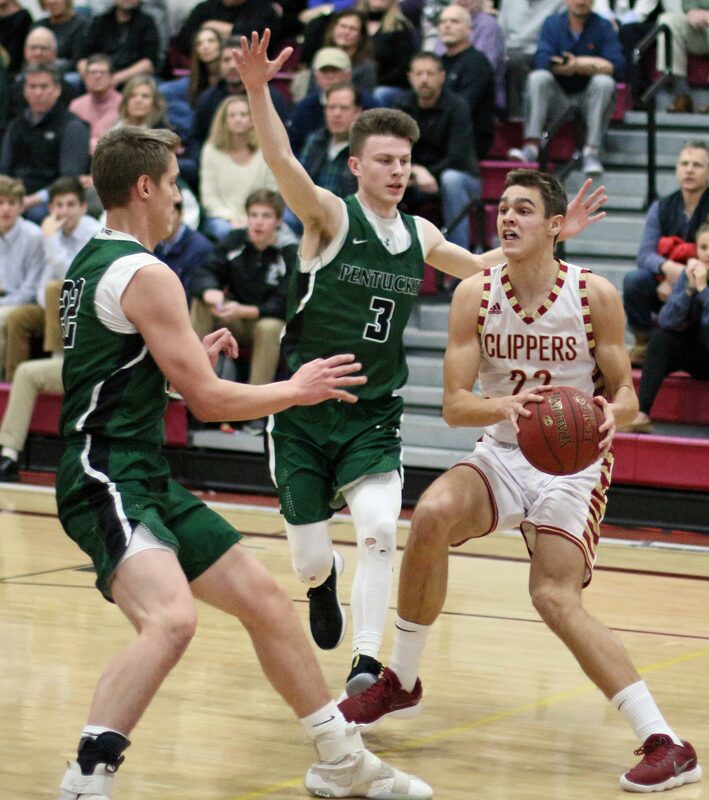 The costly result of the three miscues was a 21-13 loss to Newburyport in a Cape Ann League matchup and an extension of a losing streak that has now reached four. 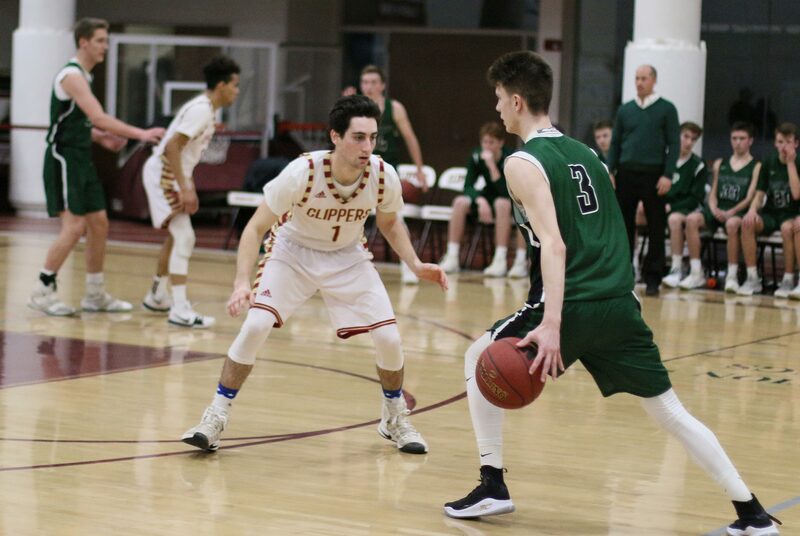 The Sachems (1-5) led 13-7 entering the fourth quarter but the Clippers (3-2) tied things one minute into the final frame. 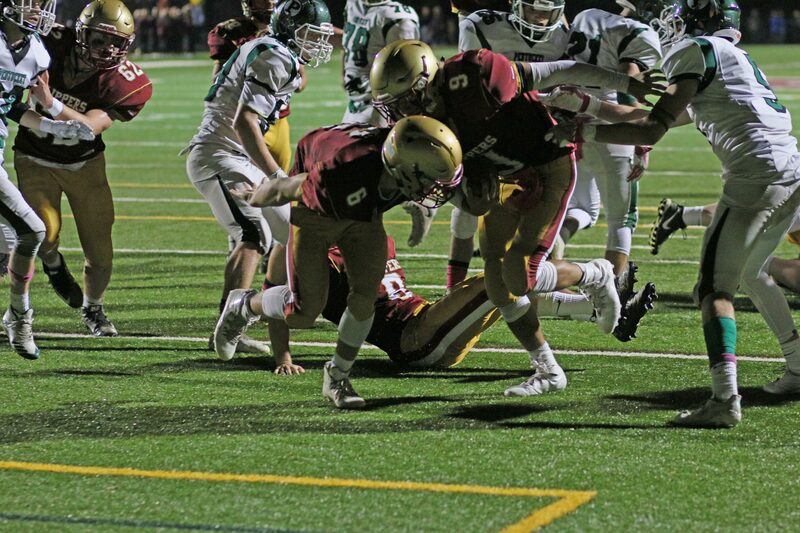 The visitors followed with a forgettable possession that included a holding penalty (Liam Murray), a sack (Connor Smith), and an interception by junior Thomas Murphy. 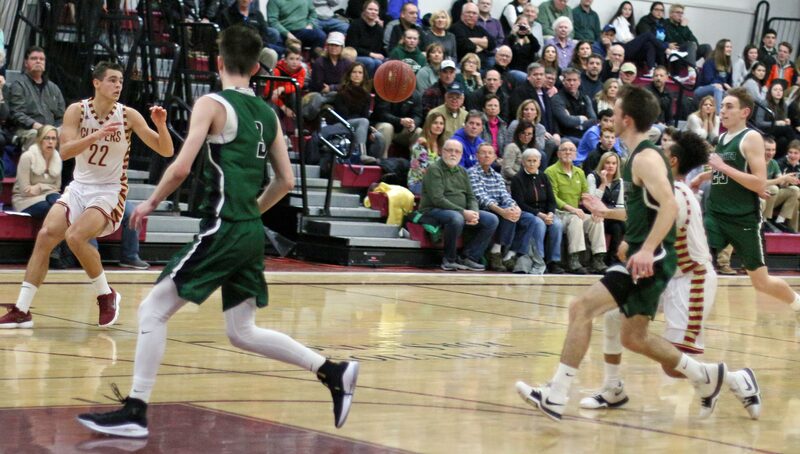 Set up on the Pentucket 36 with 7 ½ minutes to go, Newburyport ran senior Myles Maloof right on one play and left on the next. On the first play, Myles was untouched thirty-six yards into the end zone. On the second play, Myles was untouched for the two-point conversion. NBPT led 21-13. 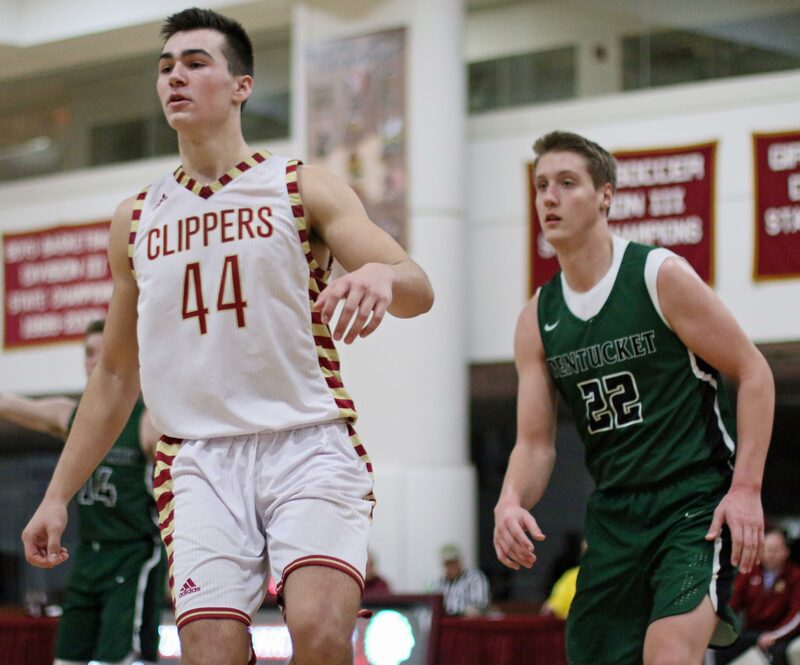 Untouched runs always direct your attention to terrific blocking and there was plenty of that for Newburyport with the outcome in the balance. The Sachems had 7:29 left to catch up. They ended up with two possessions. 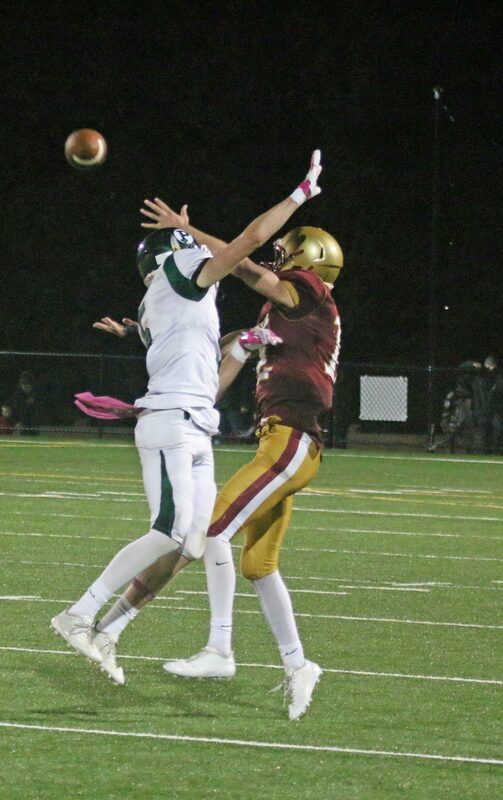 During this game’s hectic ending, quarterback Gus Flaherty had first-down passes to wide receiver Nathan McGrail in both possessions. 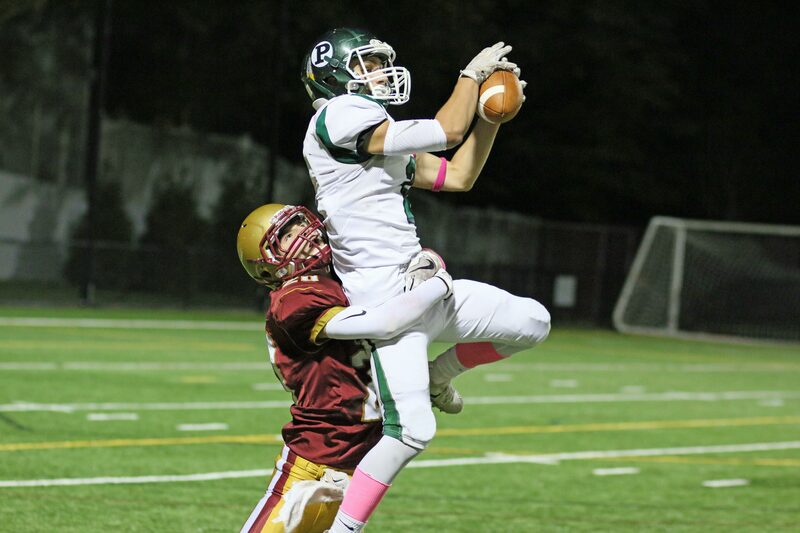 Nathan’s catches brought Pentucket to the Clippers 32-yard-line where both drives ended. 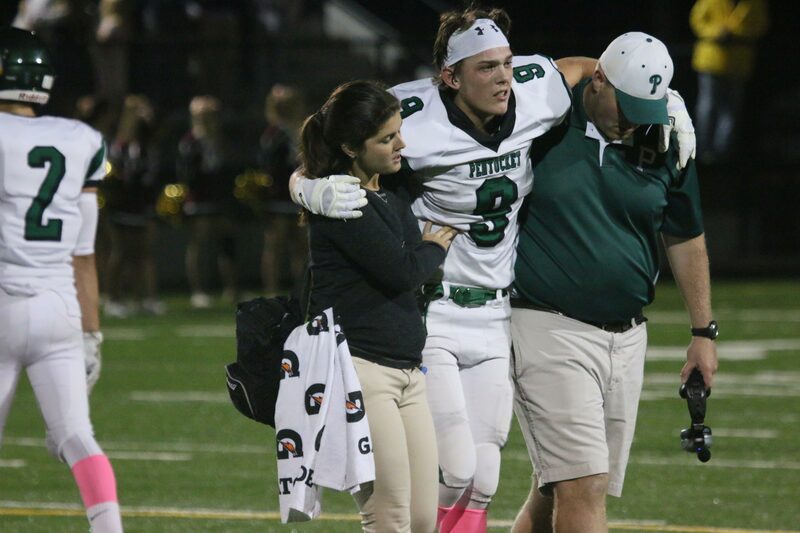 In the first of those Pentucket possessions, a sack by NHS senior Eben Mulvey was the killer. The next possession? 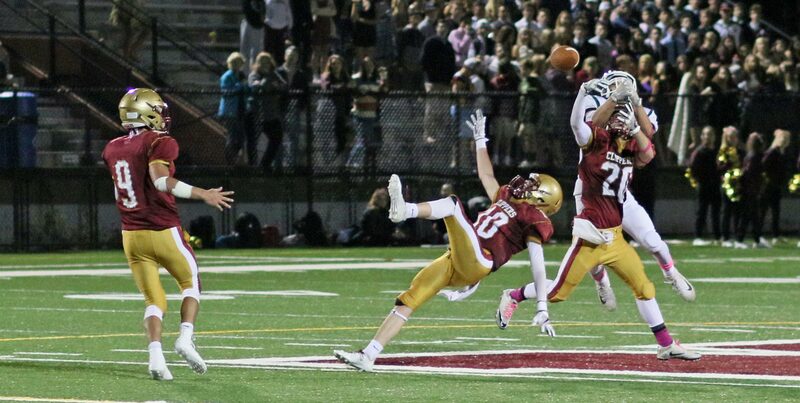 A game-deciding interception by Myles Maloof that turned out to be the last play of the contest. Truly an exciting game at a terrific stadium with fine weather to boot for a mid-October night game. I referenced the costly mistakes of Pentucket. There were others they made that weren’t costly but could have been. The Sachems had fumbles in the first and second quarters that were recovered (Gus Flahery, Brian Wilbur). Later, a low snap by center Jack Mitchell on an extra point attempt threw off the timing of Daniels Lathum and his kick went wide right. The missed EP didn’t hurt because the Clippers missed on their EP attempt after their second touchdown. 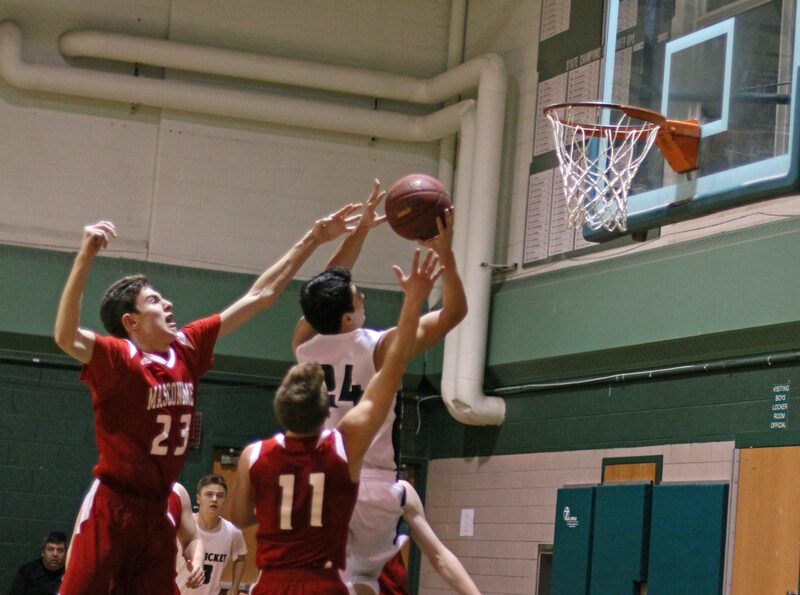 The Sachems had serious trouble, especially in the second half, stopping Myles Maloof. Clever ball-handling by QB Owen Bradbury was a factor. (I found myself visually chasing the wrong runner on several occasions.) I have included pictures to show the kind of blocking Myles had in front of him. 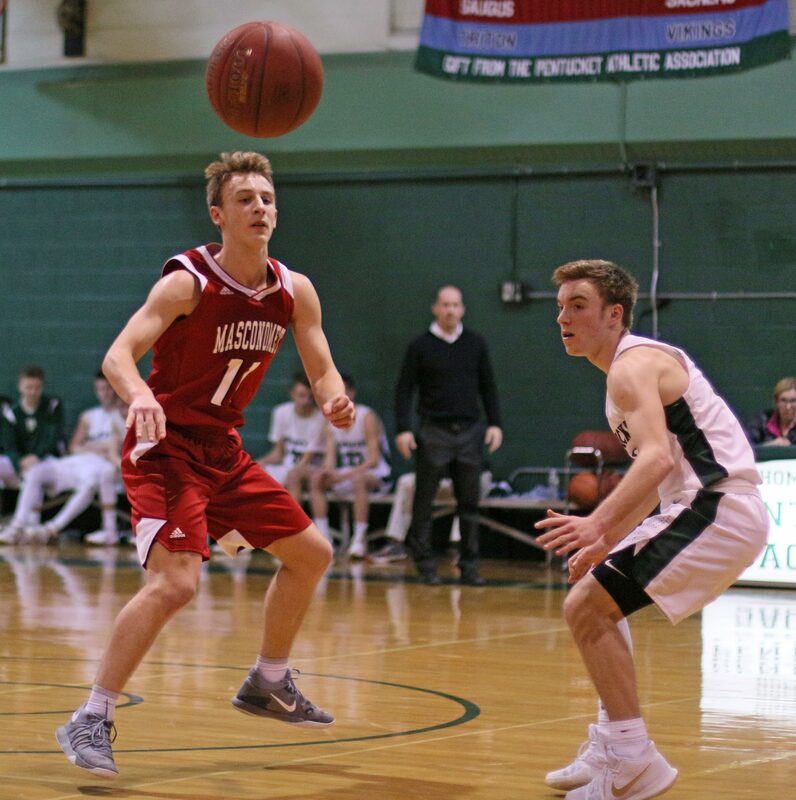 A leg injury sent two-way Sachems starter Ethan Dore to the sidelines on Newburyport’s second possession of the game. 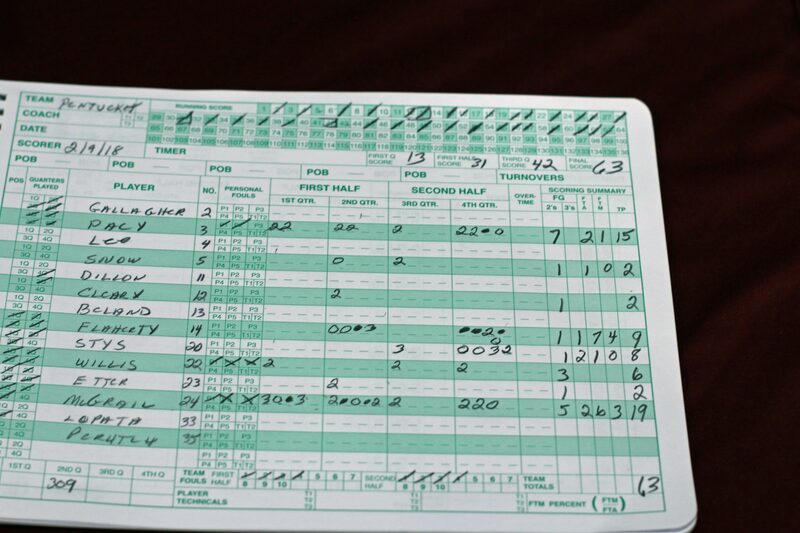 Give credit to the Sachems because despite all these handicaps they gave the Clippers plenty of trouble. 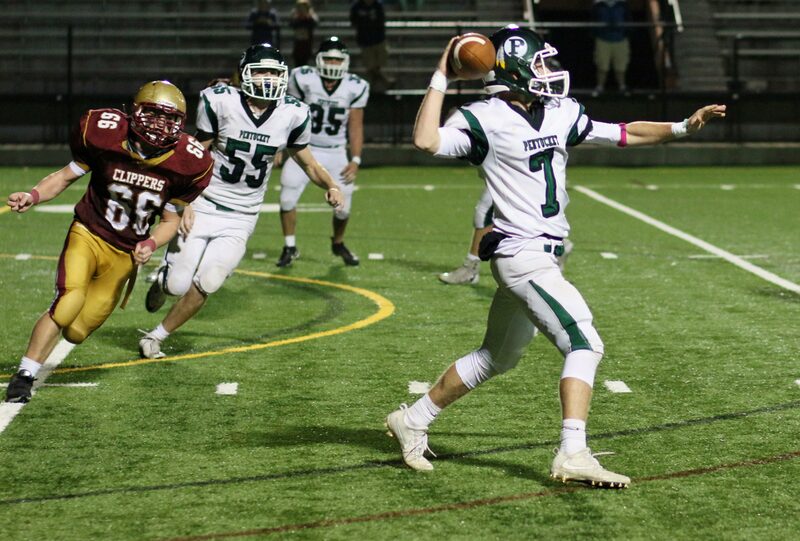 Pentucket was able to run the ball (Brandon Wilbur) and pass it during the first half. The second half? The Clippers took away the run. 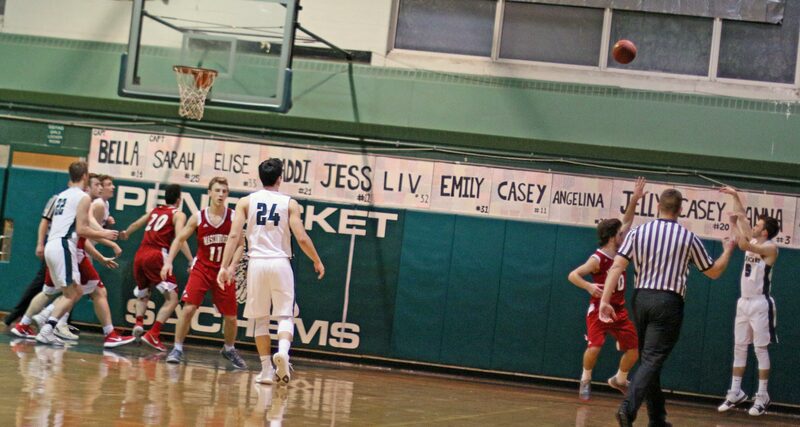 That left the Sachems one dimensional and easier to defend. The Clippers single coverage gave way to zone coverage in the end game and interceptions resulted. Nathan McGrail (8 catches/132 yards) and Jake Etter (7 catches/68 yards) were favorite targets of QB Gus Flaherty. 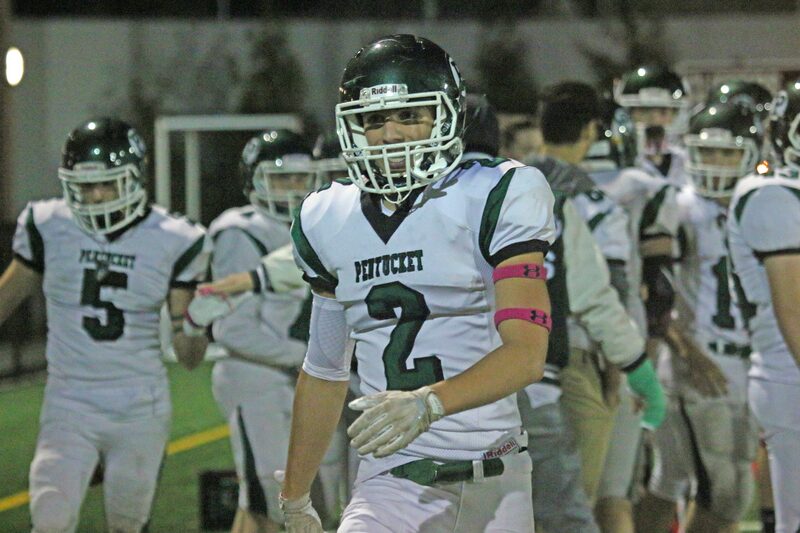 Nathan torched the NBPT secondary twice for scores. Both times the Clippers deep defenders appeared to underestimate the arm strength of Gus Flaherty (17-for-24 217 yards) and were beaten deep. Later when Newburyport’s zone coverage was in place, there was no getting beaten deep. Extra defenders downfield in the pass-receiving areas led to the two crucial late-game interceptions. Connor Smith excelled on offense and defense for the home team. 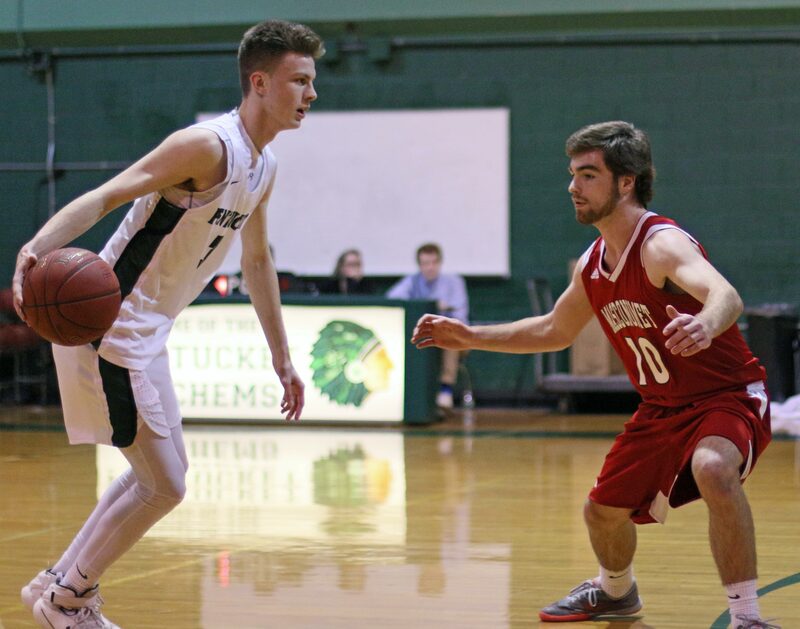 With good height and instincts, he provided constant problems for Pentucket. Just wondering: If coaches can manage defenses without having a player come to the sidelines and report back in, why can’t they do it on offense? I think of that when a team needs to move quickly because they are trailing, but instead the trailing team waits while the seconds run off for the quarterback to go to the sidelines and then back to the huddle. How to drive your coach crazy. 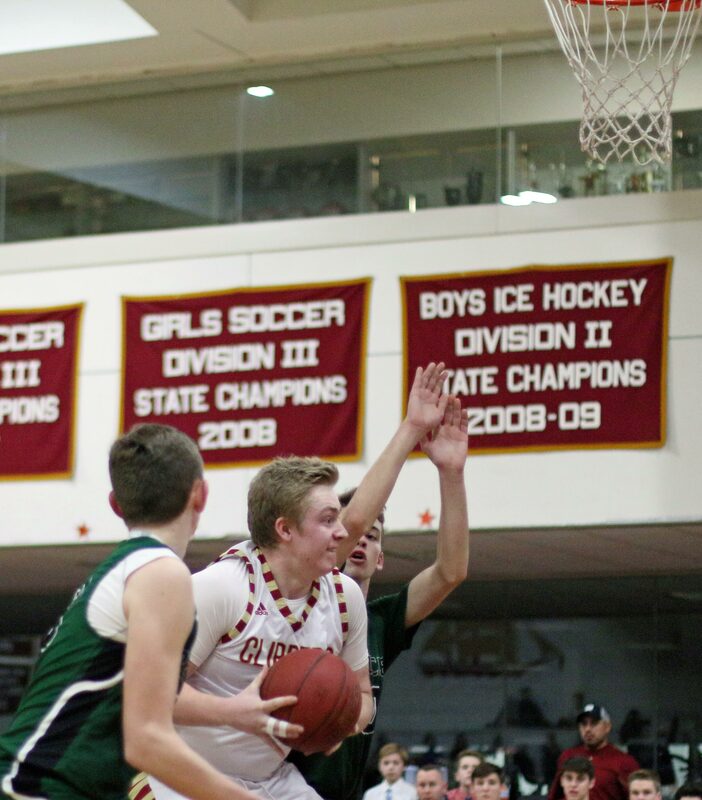 Late in the game, Newburyport had the lead and the ball. 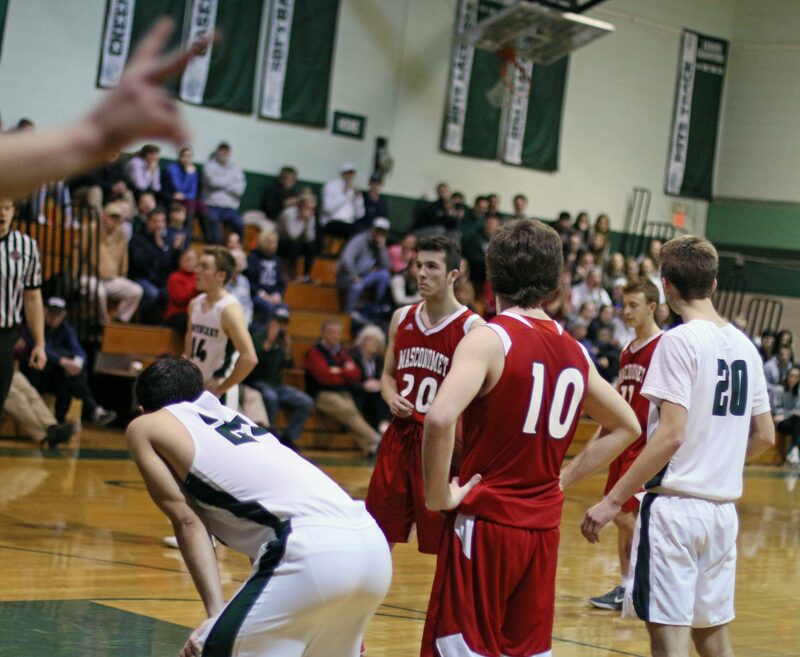 Pentucket was burning it timeouts hoping for another series of downs. Newburyport quarterback Owen Bradbury looked to be running an option but at the last second decided to pass into the flat. The ball was dropped and the clock STOPPED with 59 seconds left instead of running and running until a 4th down punt was attempted quite a few seconds later. 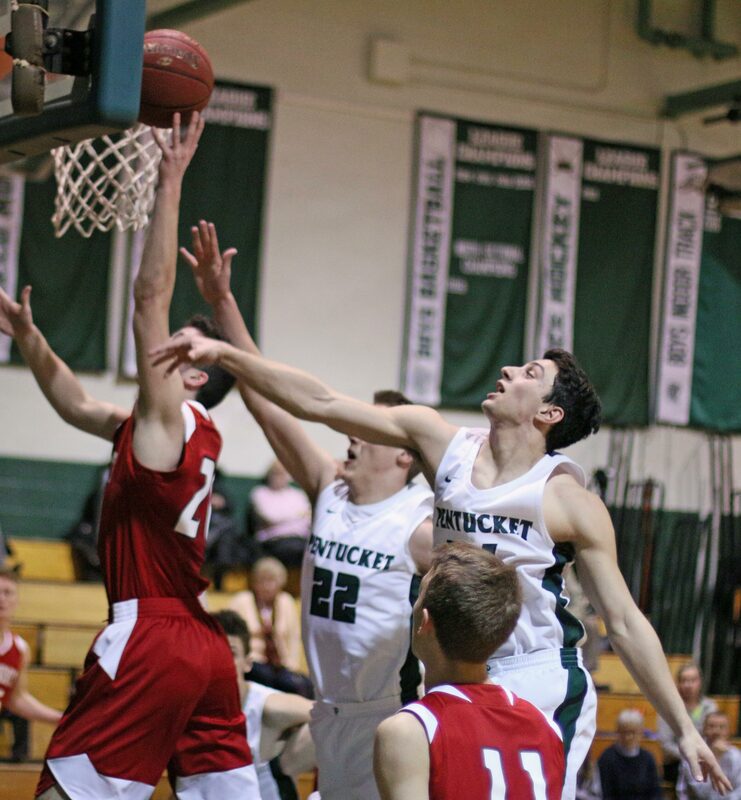 Pentucket had won four of the last five meeting with Newburyport. 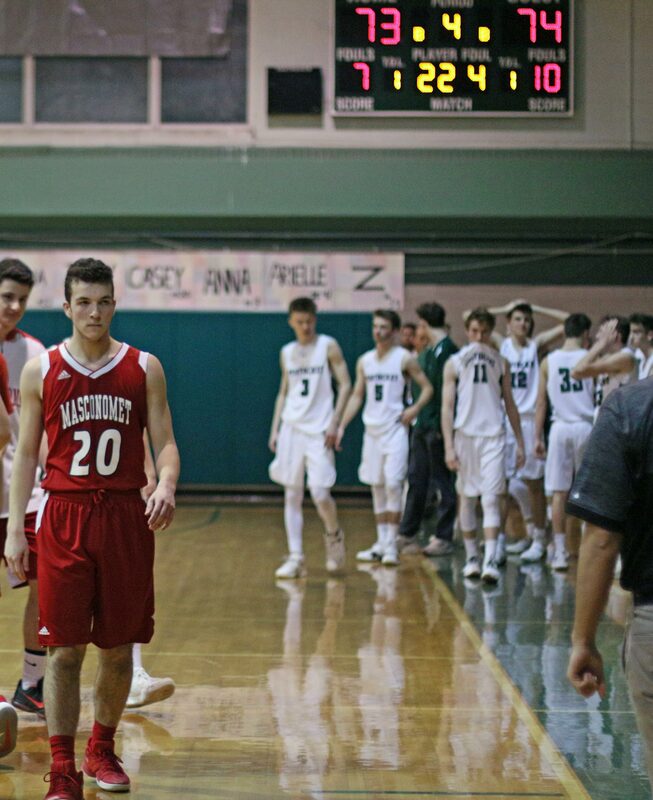 Both teams were defeated badly by Masco. 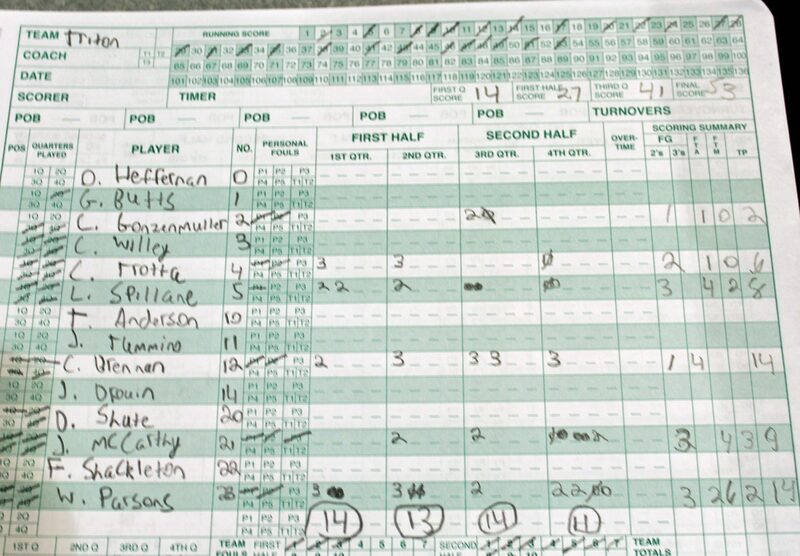 Lynnfield also took down Newburyport by a big score (32-0). Pentucket has the Pioneers ahead on their schedule. The lights and the setting at the stadium were excellent. 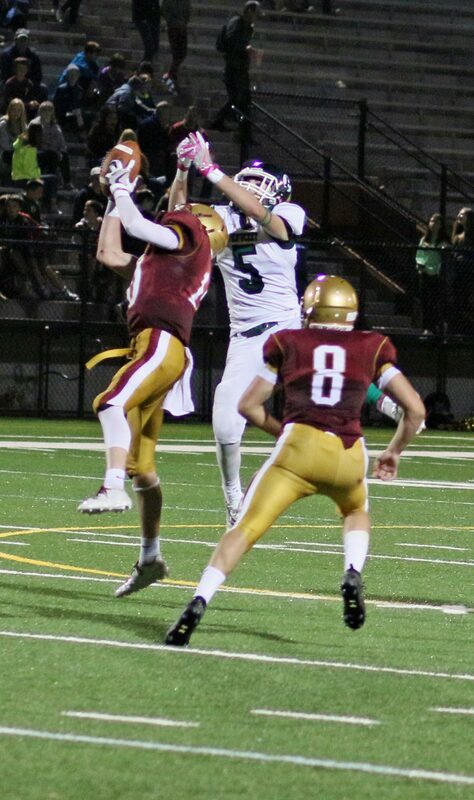 Wide receiver Nathan McGrail showed the ability to jump over defenders. 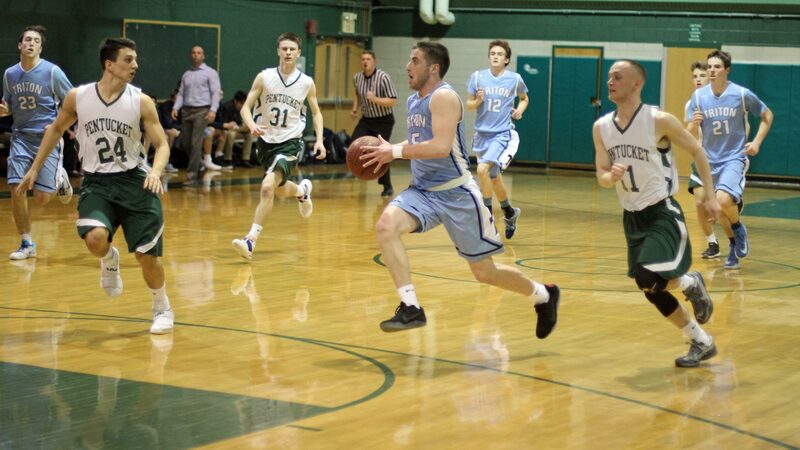 Liam Spillane breaks in after a steal. (West Newbury MA) We all watched the last shot to see if this game would go into overtime. 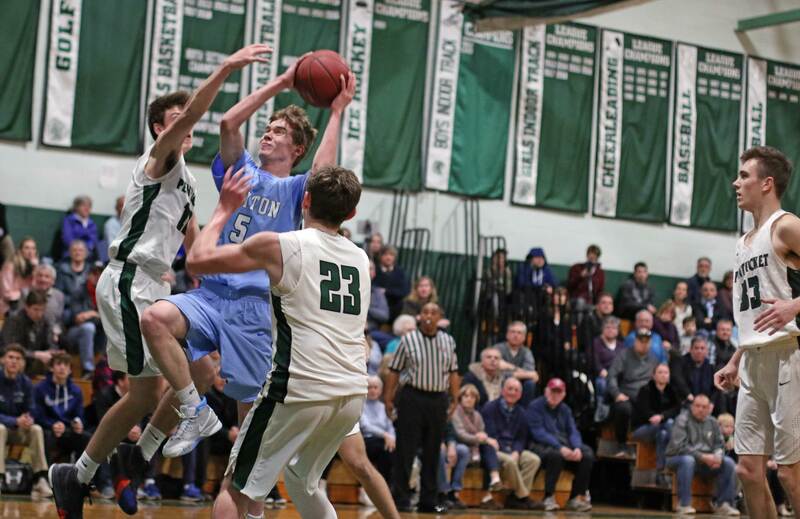 When Conor O’Neil’s 3-point attempt bounced away after hitting the rim Triton had a 53-50 win over Pentucket on Wednesday afternoon/evening. 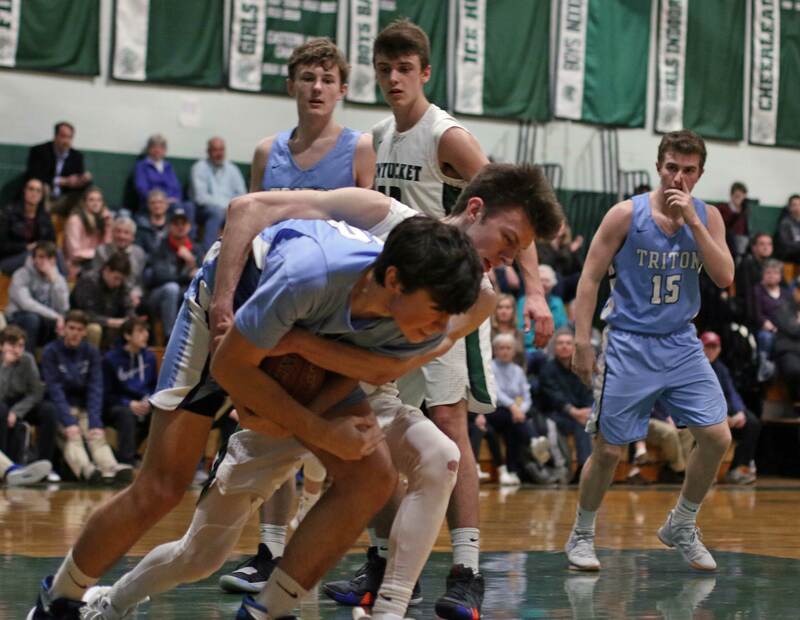 This was a close Cape Ann League game with eight lead changes in the first half and three ties in the final quarter. 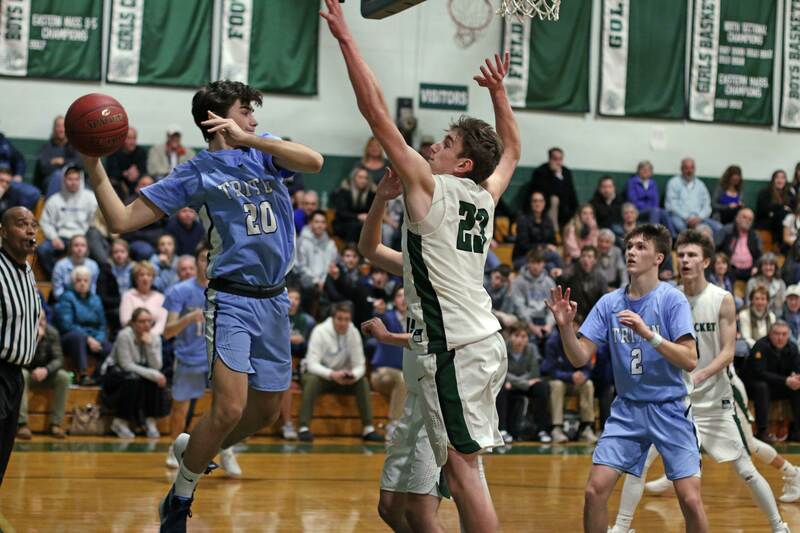 The Vikings (4-2) rode Colin Brennan’s two last-minute 3’s in the third quarter to take its biggest lead of the day (41-33). 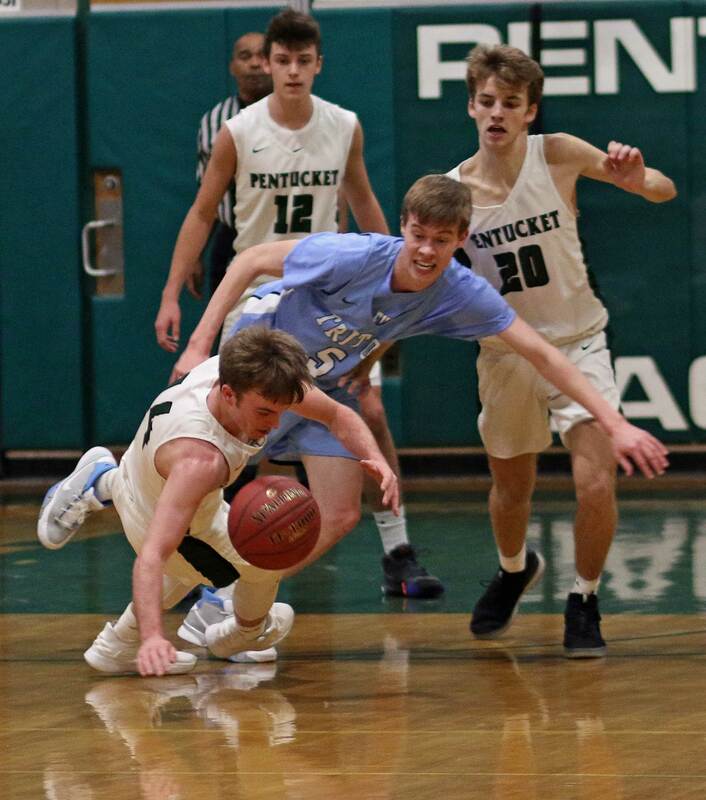 Pentucket (2-4) did not go away. 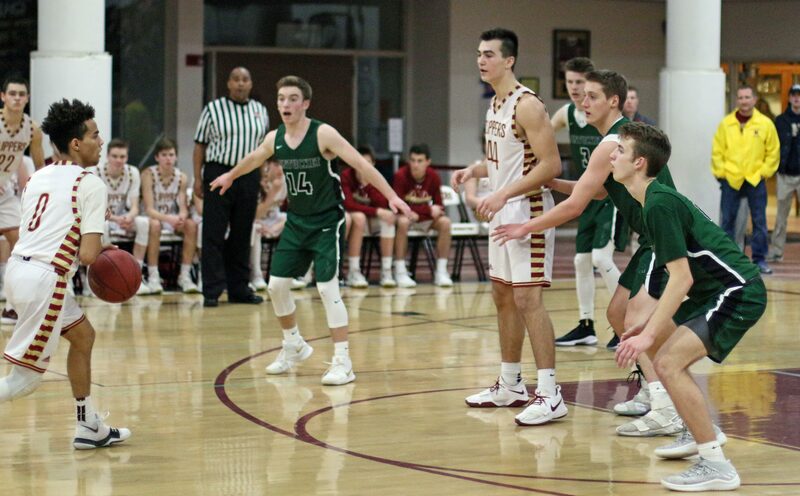 They started the final period with eight unanswered points on 3’s by Steven Johanson and Conor O’Neil plus a Nate McGrail layin. Suddenly the game was tied (41-41) with just under six minutes left. There for either team to win. 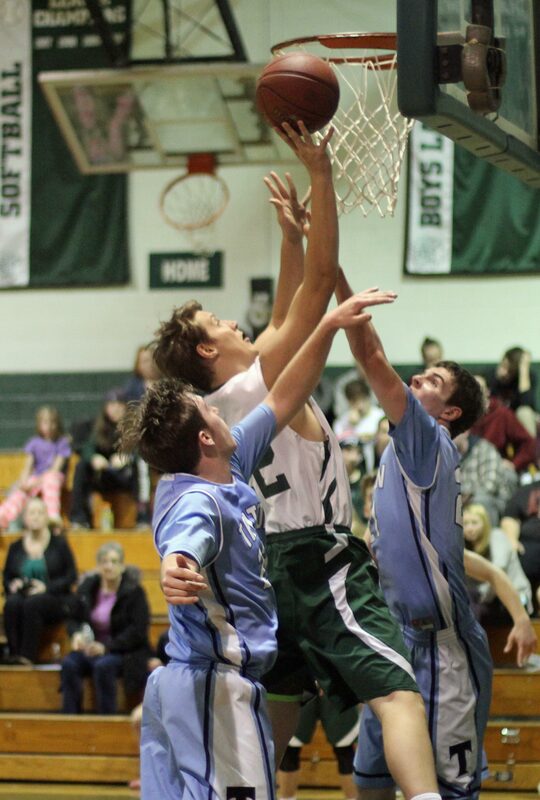 The Sachems were only down one (49-48) with 2:26 to go after sophomore Spencer Pacy’s layup. 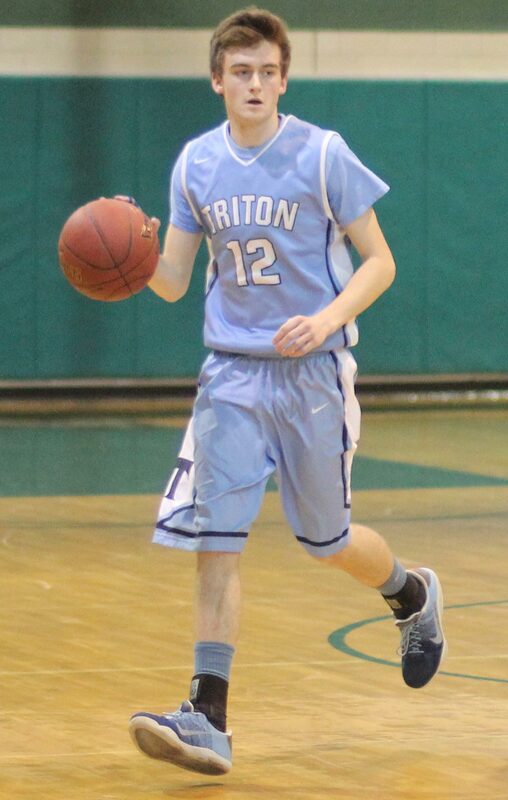 The next two scores were by Triton and they were crucial to the outcome. 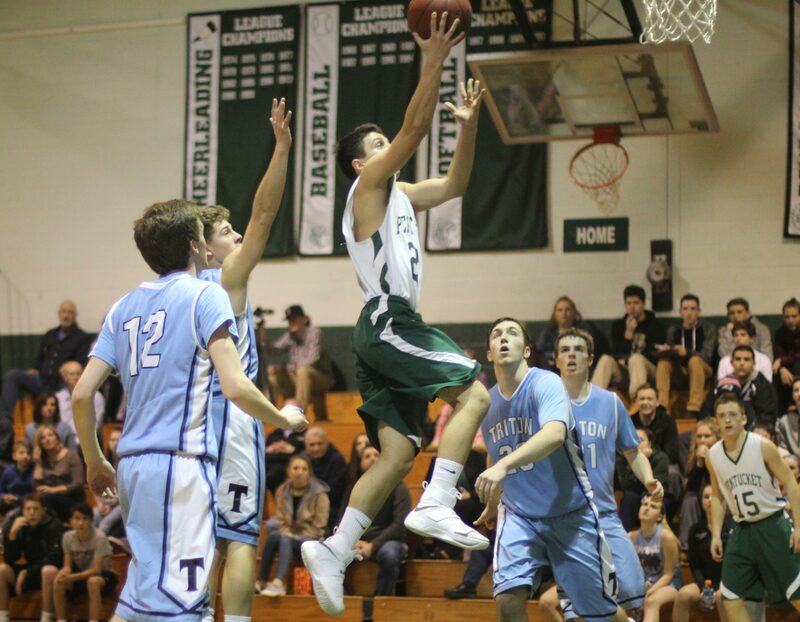 John McCarthy’s jump shot put the Vikings up by three (51-48). 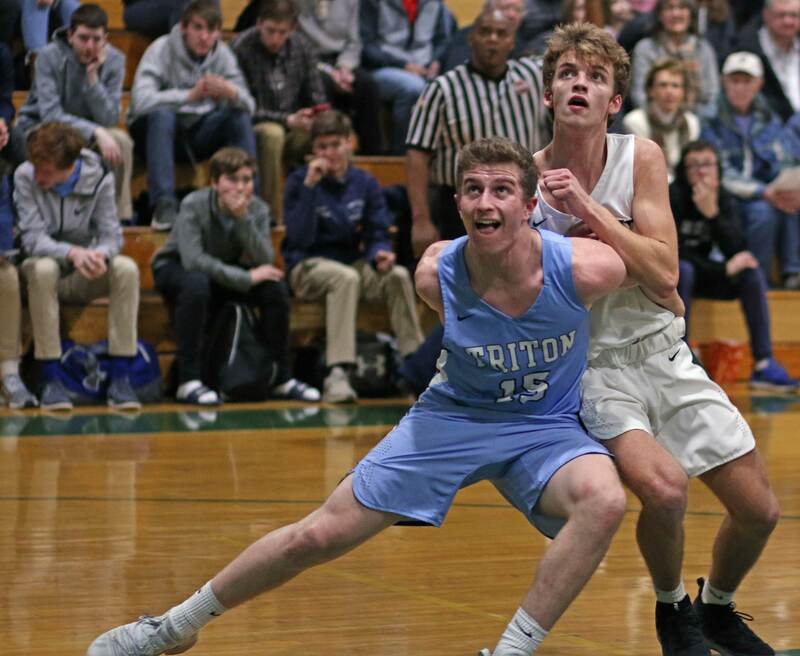 Then came the killer score as Triton ran down the clock and Will Parsons made an off-balanced leaner in the lane as the shot-clock sounded. A five-point lead with 1:13 left should be safe but not when you miss all four free throws in the last minute. 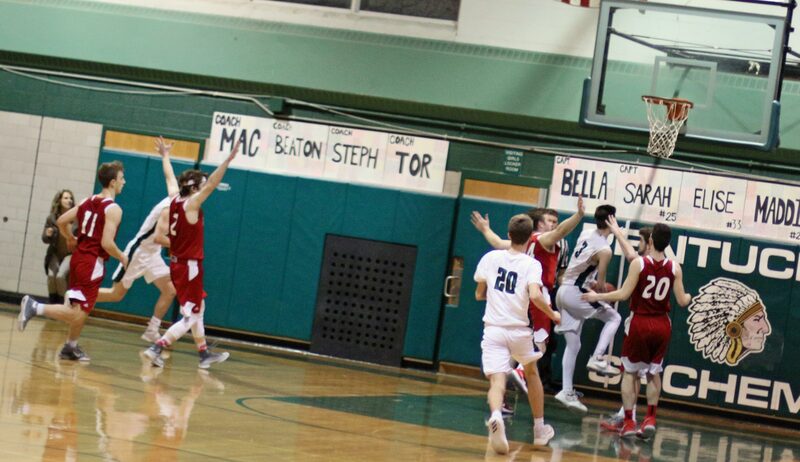 Fortunately for the winners from Byfield, Pentucket was no better at the line. 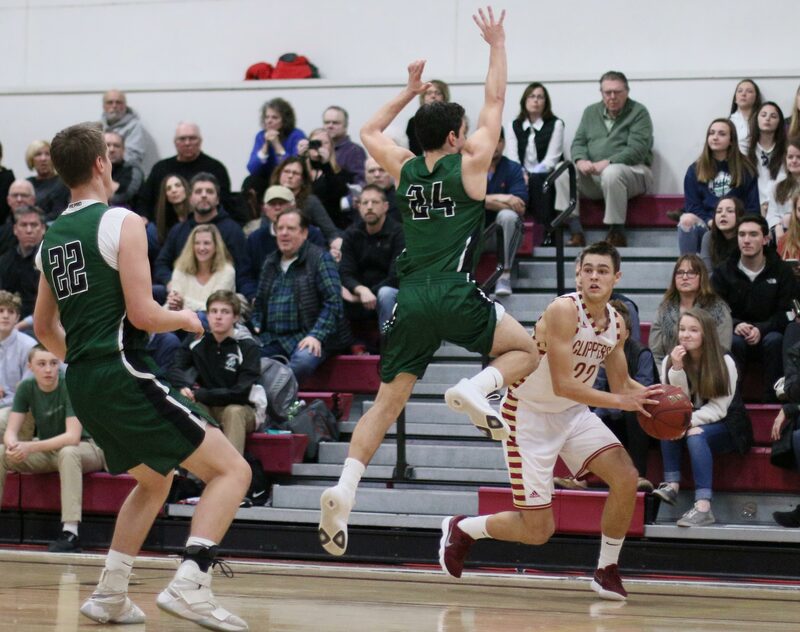 After Nate McGrail converted an offensive rebound the Sachems missed two free throws including the front end of a one-and-one. 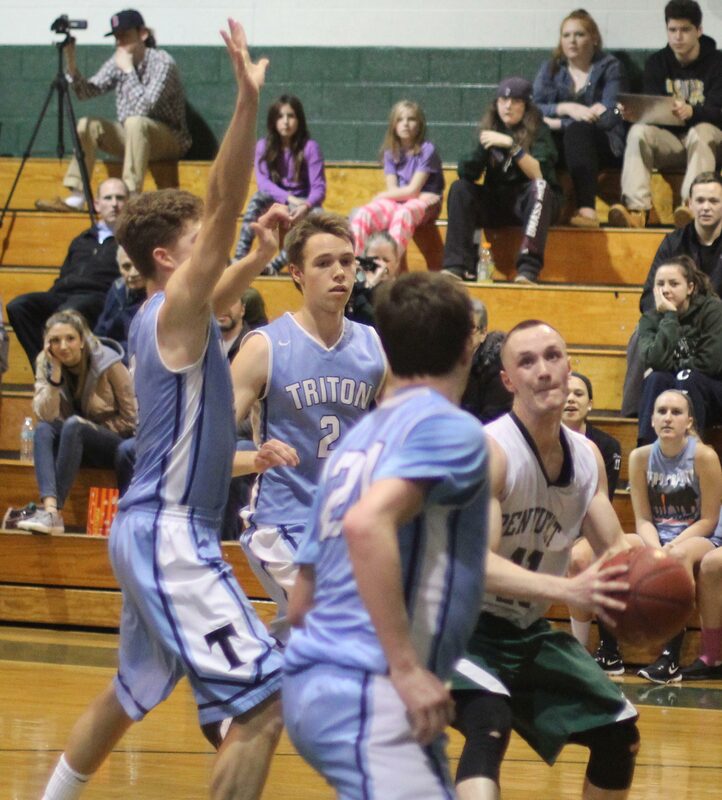 However, because Triton also missed free throws Pentucket ended up with a shot to tie. Conor O’Neil had two defenders (Liam Spillane and Chris Trotta) to shoot over but there was a window for the game-extender from the top of the key. 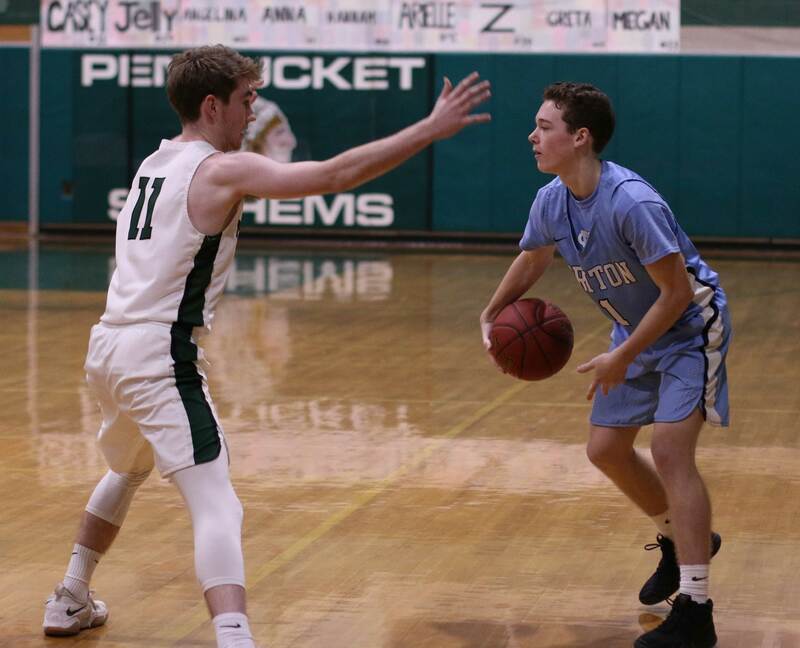 Will Parsons and Colin Brennan each had fourteen points for the winners. Colin connected four times from long range. 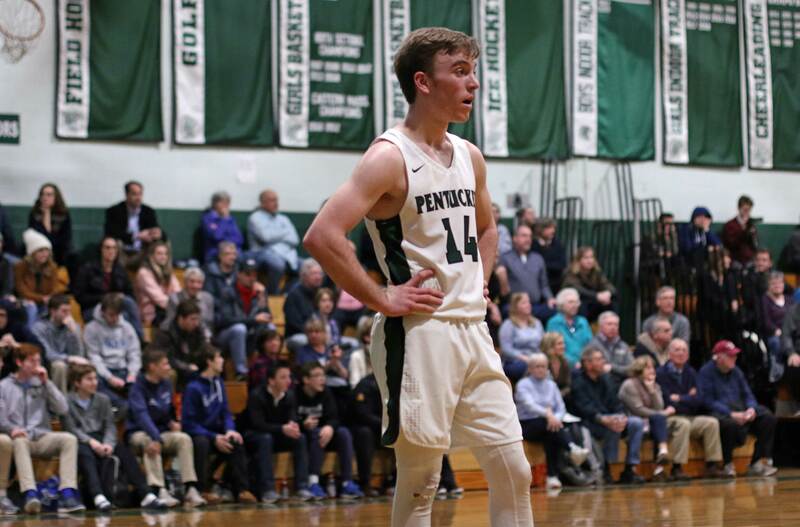 Spencer Pacy (14), Nate McGrail (10), and Gus Flaherty (10) reached double figures for Pentucket. 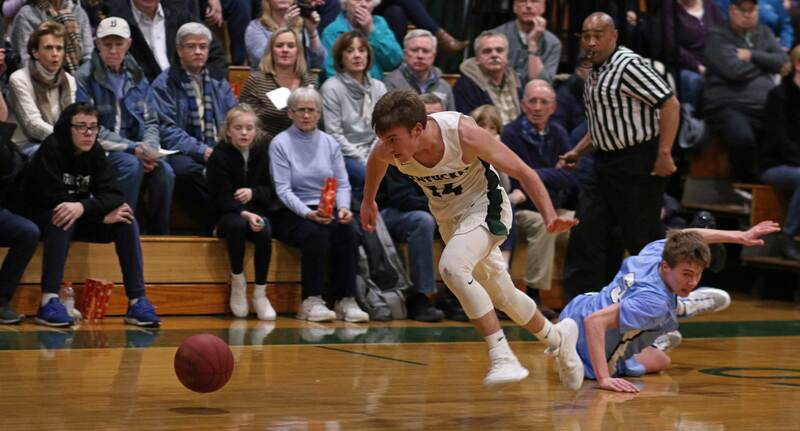 The game was originally scheduled for Tuesday night but the power went out at the Pentucket gym just before the game actually started. 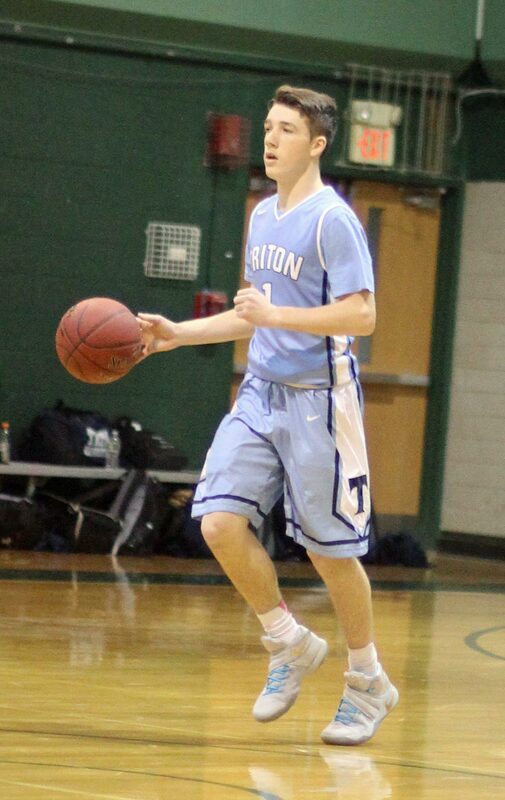 Triton’s Liam Spillane had an impressive first half with points, assists, and steals. 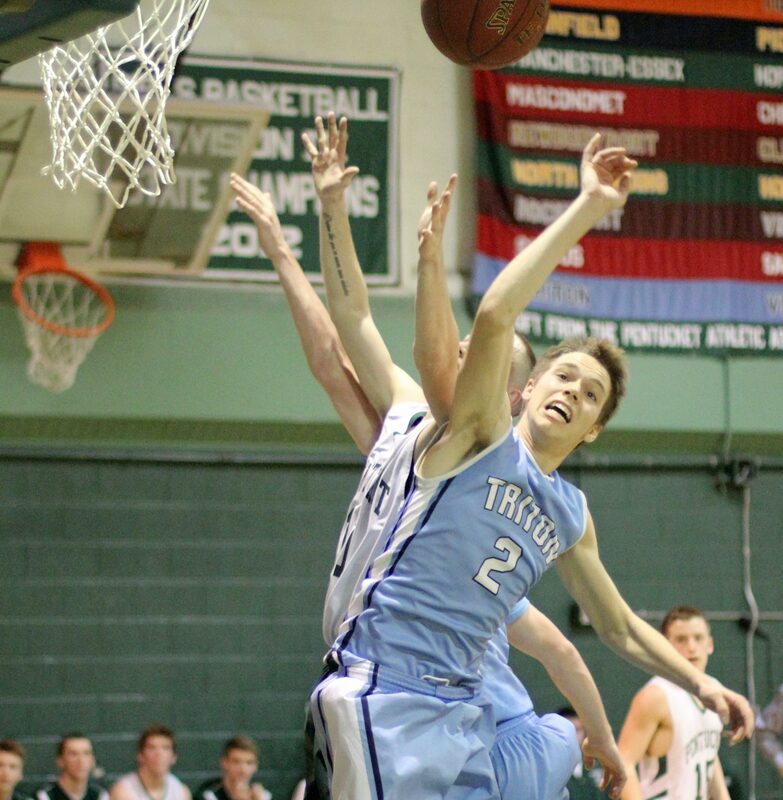 Pentucket’s Spencer Pacy had the knack of getting to the basket and finishing. 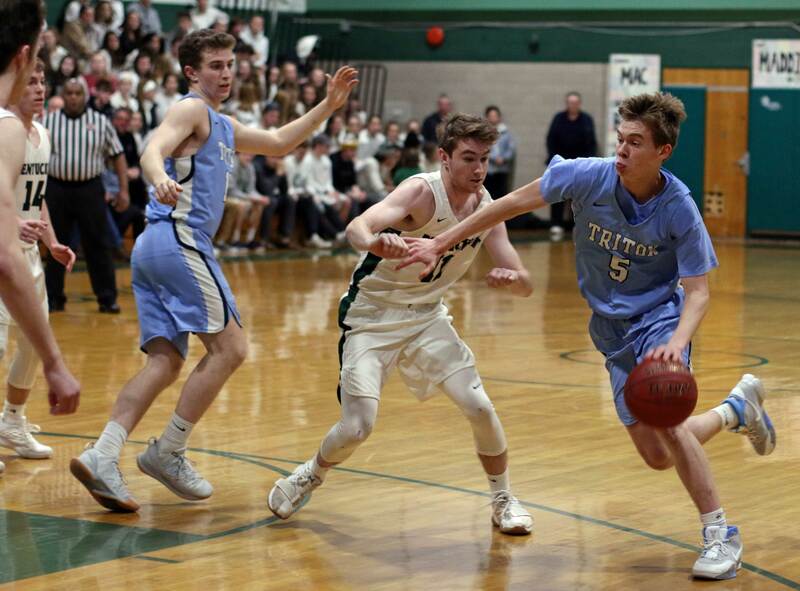 Going into this one Pentucket had won five of the six previous games against Triton. 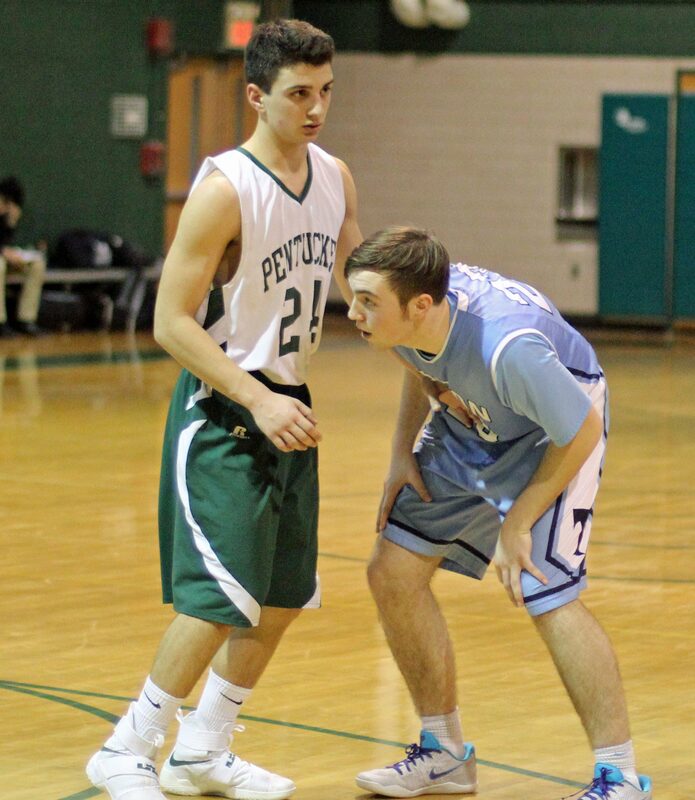 One of Pentucket’s top three scorers from last season (Jimmy Cleary) was inactive due to an ankle injury. 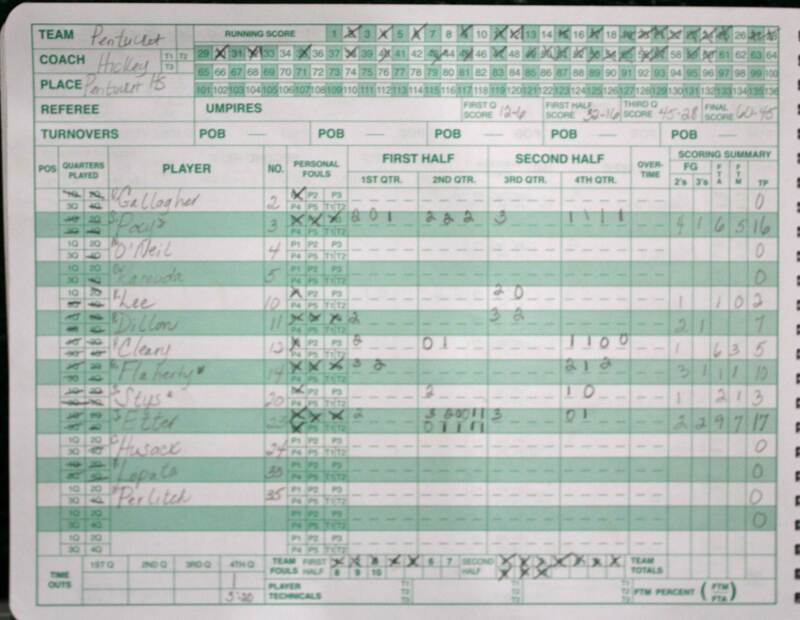 The Sachems could have used his outside shooting versus Triton. Jimmy should be back playing next week. 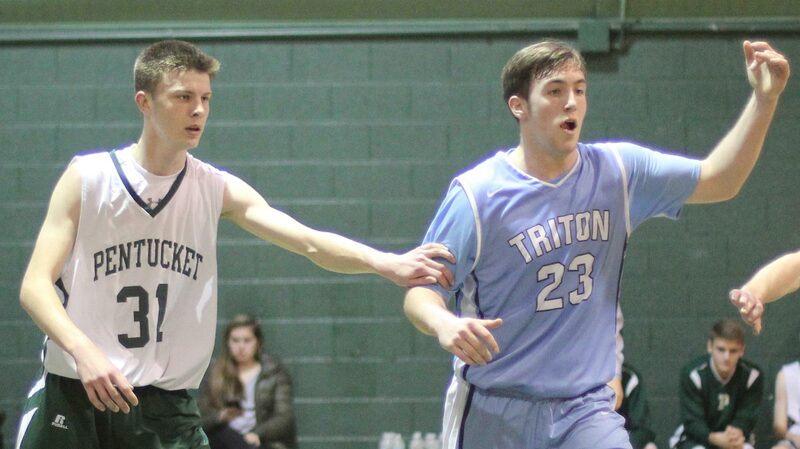 Triton was 9-11 last season while Pentucket was 9-10. 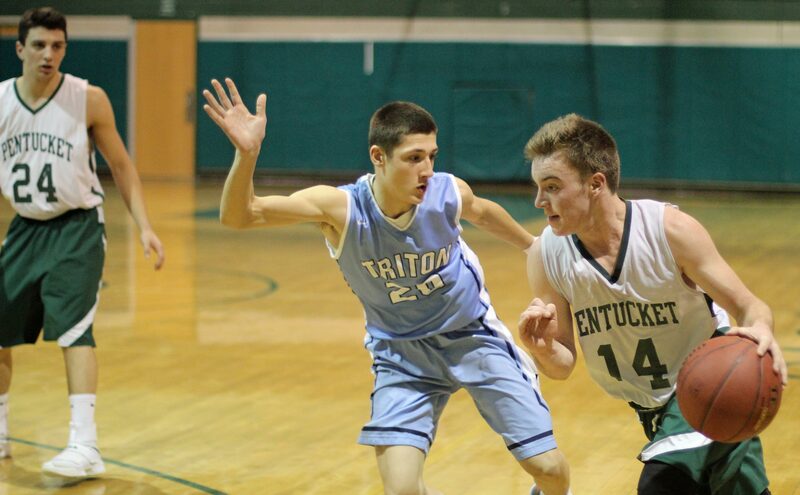 Triton box from the game. 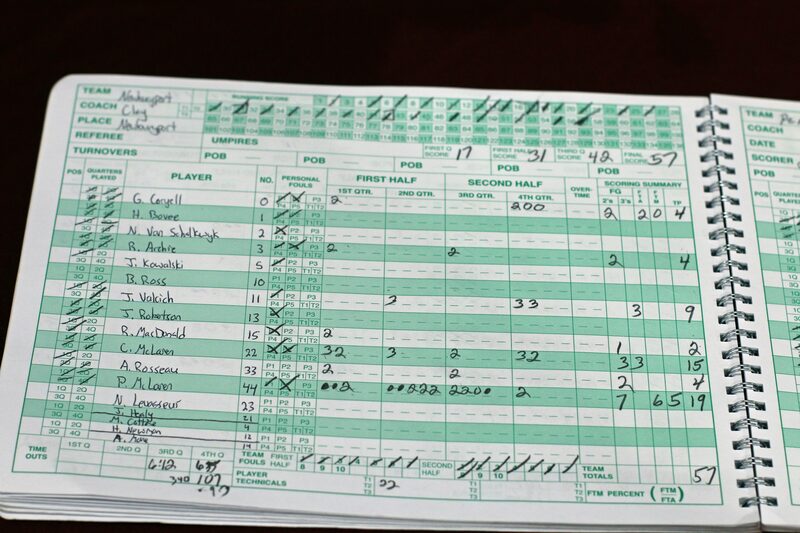 Pentucket box from the game. 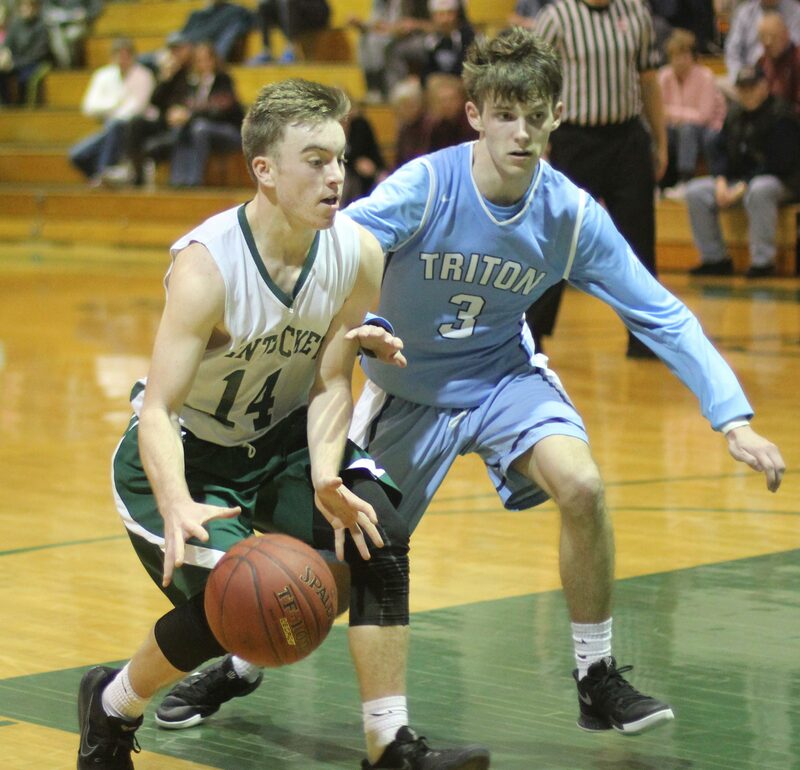 Triton hosts Georgetown on Friday night while Pentucket hosts Manchester-Essex.